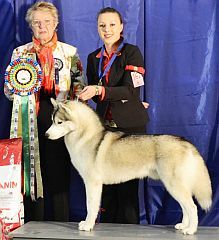 Belukha champion Siberian huskies in South Africa. We are KUSA Accredited breeders. 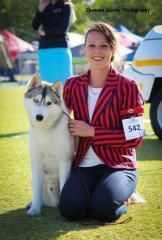 We are the owners of # 1 Siberian husky male 2014, #30 all breeds in South Africa, KUSA Best in Show winner 2014, and KUSA National Puppy 2014. We have bred local and international champions, and grand champions. We breed healthy, beautiful dogs with great temperaments. 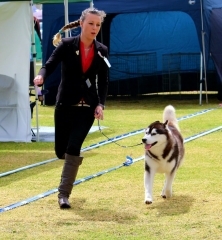 We are proud owners and breeders of Top Winning Show Dogs Locally and Internationally. All parents HD/ED and Eyes have been tested and cleared before breeding. Puppies only available to strictly selected Pet homes and over the age of 10 weeks! I came to SA in 2006 from Bulgaria (Europe) and I got my first Siberian husky. He was a show dog. The Siberian husky is a beautiful breed but is not suitable for everyone. They are a breed that needs lots of attention, hates been left alone for long periods and a bored Siberian husky is an unhappy dog. That is when they get the idea of escaping and destroying what they can in your home . 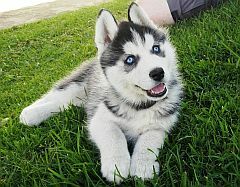 Best thing would be owning more than one Siberian husky as they are pack animals. A big yard would be ideal but again a lonely Siberian husky would not run by itself. Siberian huskies are extremely friendly dogs they would not do well as a guard dogs . Our dogs / puppies temperaments are wonderful with children of all ages. As a breeder and a groomer I would never suggest you cut /shave your Siberian husky coats - that can cause skin cancer from the sun. Rather groom your Siberian husky weekly and take to a dog salon for a wash, blow dry and groom every 6/8 weeks. That would keep coat in great condition. The double coat of the Siberian husky isolates it from cold and hot weather. They only need lots of fresh water and good shade in the hot hours of the day. Sometimes they relax in the sun for hours. The kennel name, "Belukha" is registered with KUSA. We register our puppies with KUSA breeding restrictions. We give a registration certificate to the buyers. Puppies are sold on pet contract but can still be shown if someone is interested in the sport. We have a pet quality female and male we sold in Cape Town. She is now a South African Champion and her brother has taken Multi Best Neuter In Show awards. more siberian huskies puppies (other breeds) advertise!